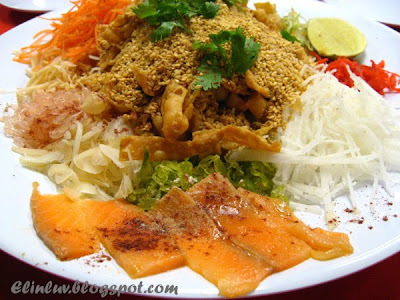 This delicacy comprises of a colorful array of ingredients - shredded green and white radish , shredded carrots, pickled ginger, pomelo and shredded turnips and raw salmon slices and the ingredients are topped with various condiments including deep fried flour crisps, crushed peanuts, sesame seeds, cinnamon powder, pepper and other spices. All at the table would then jointly toss the salad with a generous amount of sweet plum sauce and cooking oil to add sweetness and taste. 'Loe hei ' is the the tossing action which signifies prosperity and longevity , all adding to the good wishes for the new year . ' 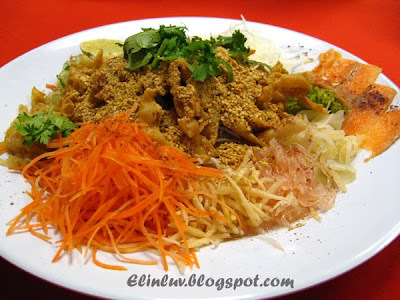 hei ' means rise, a reference to thriving business :)) thus a dish popular with businessmen. The Piggies clan will not miss this dish and the actions that goes with the dish....haha my Piggies love to toss those colorful ingredients together up high LOL! 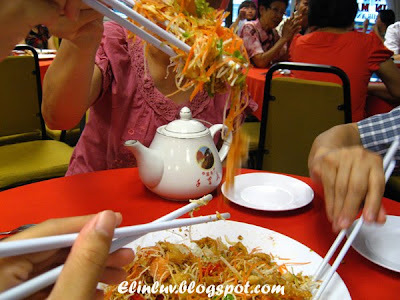 I love to see the happy smile on their faces haha....surprisingly they love this dish and we never fails to order this when we eat out at restaurant during the Chinese New Year. 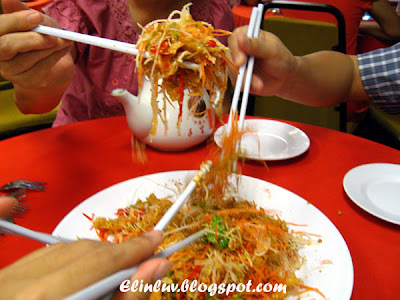 This ' yusheng ' is from Marpoh Restaurant in Ipoh Garden. scoop of the salad....greedy?? I think so ! The greedy momsie caught in action LOL! prosperity and longevity be yours ! hey, i finished mine during the 2nd day of cny or 3rd day, cannot remember, i steamed it..
steamed it and ate with scraped coconut...forgot to take pic also.. hehehe.. too wai sik! I like this fried! My grandma use to sandwich it in between yam and then fry them. Hi,tks for your sharing your recipe but could you advise the no. of eggs needed? Many thks. Hah..this post remind me that I still have a glutinous rice cake in the fridge. Will ask my MIL to make it for me. Cheers! 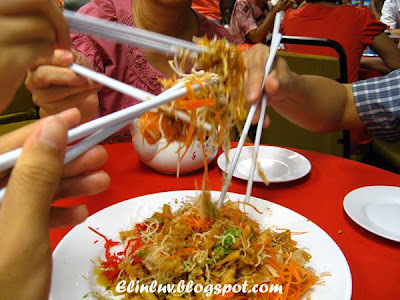 You just reminded me of my younger day, Elin, remembering those day when i was a child and the family was not well off, this deep friend nian quo is what we had throughout the days during CNY.. I'll need to cut it and put in the fridge, otherwise I'll require a chopper to do it. Will use your recipe to fry it with taro and sweet potato. Hi Eugene...yup my grandma used to fried them when we were young...poor man's delicacy but now selling at high price :)) Oh your wife don't know..you must ask her to come here more often then LOL!